We have our first report of an app rejected from Palm's app catalog, but at least there's a clear and understandable (if somewhat maddening) reason. I won't spite the user community just because of Palm's decision. I will release NaNplayer to the Homebrew gallery once it is done. However, this will still leave most Pre users to get by with a music player that doesn't even let them create a playlist. However, I will slow the pace of development considerably. I can't continue to dedicate so much time to developing an app that may never be released to the majority of webOS users. In all likelihood, I will not develop any more webOS apps in the future. Essentially, it appears the issue is that NaNplayer uses an undocumented API -- the same one the default music player uses -- to query music files on the device and their metadata (artist, album, genre, etc.). It's an incredible shame such a fine app is being denied, seemingly based off a useful API that probably should have been included with the official SDK. While I do sympathize with Blubble, it's best to look at both sides of the issue. An undocumented API is undocumented for a reason. Palm may alter it in the future and I'm pretty sure its usage violates the SDK EULA. One thing this rejection does clearly show is the potential breadth of homebrew apps like those you find on PreCentral vs. the App Catalog, but there's a catch. Given that our homebrew section is an unofficial testing environment for apps, developers are free to experiment with undocumented API and do things not normally possible with the standard app. But that experimentation comes with the risk that using such APIs could have unintended consequences or Palm could change them and break the app. This is just an unfortunate situation all around. Hey, at least there's our homebrew app gallery. Not only that, Palm can learn from this situation by looking at what's being done in the homebrew scene and improving their API based on what the average developer wants. Hint: the average developer wants to use the music files on the Pre. 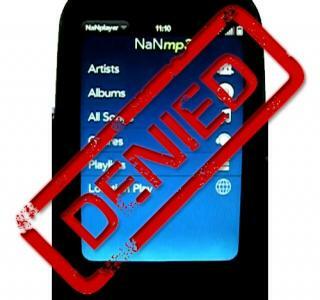 NaNPlayer is using APIs that are currently private because they will change significantly in a future release. Although we aren't able to support the functionality that JC needs right now, we are listening to the community to help prioritize which APIs and features we put into webOS. While we can’t accept NaNPlayer into the App Catalog right now, we are not rejecting it, and we are happy for it to continue life as a homebrew application until we get to the point where we can release public, supportable APIs for the functionality that it requires.